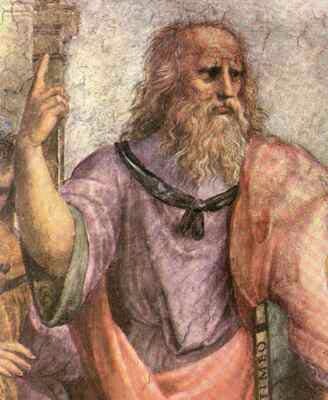 Plato, in his Republic, discusses possible methods of teaching music and the relation of music to the state. Inherent in this discussion were feelings toward modes and rhythms and the proper way to educate the youth of a society. The following excerpt comes from Book 3 of the Republic. Next in order will follow melody [melos, pl. mele] and song. I fear, said Glaucon, laughing, that the words "every one" hardly includes me, for I cannot at the moment say what they should be; though I may guess. At any rate you can tell that a song or ode has three parts ‹ the words, the melody [harmonia], and the rhythm; that degree of knowledge I may presuppose? And as for the words, there surely be no difference words between words which are and which are not sung; both will conform to the same laws, and these have been already determined by us? We were saying, when we spoke of the subject-matter, that we had no need of dirges and lamentations in words? And what are the dirgelike harmoniai? You are musical, and can tell me. The harmonies which you mean are the Mixolydian and intense Lydian, and others similar to them. These then, I said, we must do away with; for they are useless even to women who are to make the best of themselves, let alone to men. There are certain Ionian and Lydian onesthat are called "relaxed." I answered: I don't know the harmoniai, but leave us that harmoniathat would fittingly imitate the utterances and the accents of a brave man who is engaged in warfare or in any enforced business, and who, when he has failed, either meeting wounds or death or having fallen into some other mishap, in all these conditions confronts fortune with steadfast endurance and repels her strokes. And another for such a man engaged in the works of peace, not enforced but voluntary, either trying to persuade somebody or something and imploring him - whether it be a god, through prayer, or a man, by teaching and admonition - or contrariwise yielding himself to another who is petitioning or teaching him or trying to change his opinions, and in consequence faring according to his wish, and not bearing himself arrongantly, but in all this acting modestly and moderately and acquiescing in the outcome. Leave us these two harmoniai - the enforced annd the voluntary - that will most beuatifully imitate the utternaces of men failing or succeeding, the temperate, the brave - leave us these. No, by heave, I think not, he replied. Then let us now finish the purgation, I said. Next in order to harmonies, rhythms will naturally follow, and they should be subject to the same rules, for we ought not to seek out complex systems of metre, or metres of every kind, but rather to discover what rhythms are the expressions of a courageous and harmonious life; and when we have found them, we shall adapt the foot and the melody to words having a like spirit, not the words to the foot and melody. To say what these rhythms are will be your duty ‹ you must teach me them, as you have already taught me the harmonies. But, indeed, he replied, I cannot tell you. I only know that there are some three principles of rhythm out of which metrical systems are framed, just as in sounds there are four notes out of which all the harmonies are composed; that is an observation which I have made. But of what sort of lives they are severally the imitations I am unable to say. Then, I said, we must take Damon into our counsels; and he will tell us what rhythms are expressive of meanness, or insolence, or fury, or other unworthiness, and what are to be reserved for the expression of opposite feelings. And I think that I have an indistinct recollection of his mentioning a complex Cretic rhythm; also a dactylic or heroic, and he arranged them in some manner which I do not quite understand, making the rhythms equal in the rise and fall of the foot, long and short alternating; and, unless I am mistaken, he spoke of an iambic as well as of a trochaic rhythm, and assigned to them short and long quantities. Also in some cases he appeared to praise or censure the movement of the foot quite as much as the rhythm; or perhaps a combination of the two; for I am not certain what he meant. These matters, however, as I was saying, had better be referred to Damon himself, for the analysis of the subject would be difficult, you know? Then beauty of style and harmony and grace and good rhythm depend on simplicity, ‹ I mean the true simplicity of a rightly and nobly ordered mind and character, not that other simplicity which is only an euphemism for folly? And surely the art of the painter and every other creative and constructive art are full of them, ‹ weaving, embroidery, architecture, and every kind of manufacture; also nature, animal and vegetable, ‹ in all of them there is grace or the absence of grace. And ugliness and discord and inharmonious motion are nearly allied to ill words and ill nature, as grace and harmony are the twin sisters of goodness and virtue and bear their likeness. But next, what shall we say of their food; for the men are in training for the great contest of all ‹ are they not? And will the habit of body of our ordinary athletes be suited to them? Why not? My meaning may be learned from Homer; he, you know, feeds his heroes at their feasts, when they are campaigning, on soldiers' fare; they have no fish, although they are on the shores of the Hellespont, and they are not allowed boiled meats but only roast, which is the food most convenient for soldiers, requiring only that they should light a fire, and not involving the trouble of carrying about pots and pans. Neither would you approve of the delicacies, as they are thought, of Athenian confectionery? All such feeding and living may be rightly compared by us to melody and song composed in the panharmonic style, and in all the rhythms. Exactly. There complexity engendered license, and here disease; whereas simplicity in music was the parent of temperance in the soul; and simplicity in gymnastic of health in the body. But when intemperance and disease multiply in a State, halls of justice and medicine are always being opened; and the arts of the doctor and the lawyer give themselves airs, finding how keen is the interest which not only the slaves but the freemen of a city take about them.